It is the place in South Africa, where you will find the most diversity in terms of scenic nature and beauty. We have everything here. Mountains, ocean, Fynbos grass, klein karoo ( semi-dessert ), indigenous forests, white sandy beaches, rocky coastline and roaring rivers. The area between Mossel Bay and George is mostly covered with fynbos whilst east of George up to Tsitsikamma is more forestry. 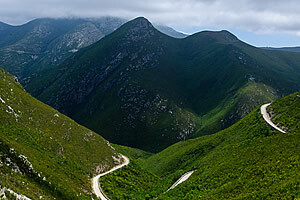 North of Mossel Bay you will find the Outeniqua Mountain range. When you cross this via a pass, you will find yourself in the Klein Karoo, which is a semi-dessert area. Oudtshoorn is also known as the ‘capital’ of the Klein-Karoo region and although technically outside the Garden Route region, it is only some 85 km from Mossel Bay and well known for its Ostrich industry and famous for world known Cango Caves and Cango Wildlife Ranch. Outshoorn is a major icon in the Klein Karoo, just north of the Garden Route, and is a very popular destination to visit. 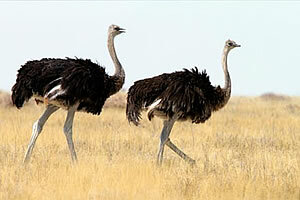 Here you will be able to see Ostriches from close range and even have opportunities to ride on these huge non-flying birds. 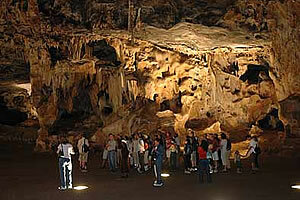 The Cango Caves are located here and you can do cave tours. The tours are great for the whole family and very informative. 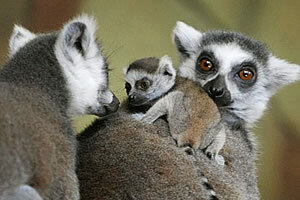 Oudtshoorn also offers other amazing animal activities. The Cango Wildlife Ranch is on the outskirts of town and here you will see Crocodiles, Lions, Cheetah, Tigers and many other wild animals. The ranch is a great way to spend half a day with the family and they have a restaurant and kids areas as well. You can also enjoy some animal interaction experiences here. About 7 km outside Oudtshoorn, en-route to the Cango Caves, you will find Buffelsdrift Game Lodge, where you will also find the Oudtshoorn Elephants. At Buffelsdrift, you can do wildlife safaris and horseback safaris. 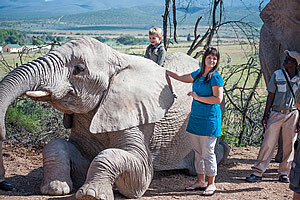 But a main attraction here is the amazing elephant experiences they offer – this can also be done at Indalu Lodge some 25 km en route to Cape Town from Diaz Beach Haven. 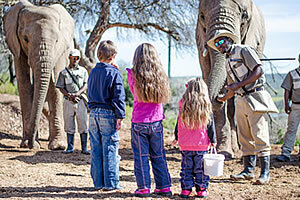 Spend some time with their elephants, feeding them, sitting on them, playing with them and even walking and riding them. Kids love this activity and it is sure to amaze you. Wilderness will entertain you with great restaurants. It is a small village with a lot of art and crafts stalls. Wilderness beach is also a massive sandy beach. Here you can do some paragliding from the hills from where you will have amazing views.You can also kayak or canoe up the calm river, surrounded by forest filled gorges. When you can’t go any further, you can beach your canoe and follow a hiking trail that leads to a waterfall where you can enjoy a picnic. Wilderness also have a few day hiking trails. 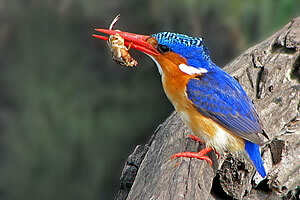 They are forest hikes where you will experience rich bird life and spot the Knysna Loerie and King Fisher birds. Knysna is known for its beauty. The lagoon area is popular for boating and enjoying time at the popular, which includes the yacht basin. You can take a paddle boat cruise to the Featherbed Resort across the lagoon. There you will find hiking trails and a great restaurant. The paddle cruise will take you from the harbour to the Knysna Heads, with its excellent views. 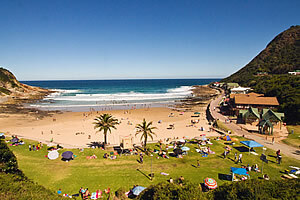 Knysna is also a popular golfing town with the well known Pezula and Simola golf courses nearby. Click here to read all about the Knysna golf courses. The area is mostly covered by indigenous forest. We would say this is the Hiking, Trail Running and Mountain Biking mecca of South Africa. Knysna’s Thesen Island is a favourite spot to dine. 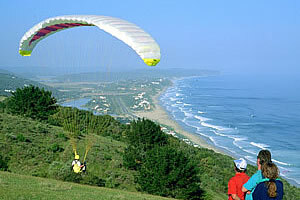 At the Knysna Heads you will also have great views over Knysna, the lagoon and the ocean. At the bottom of The Heads you will find a restaurant with unique dishes to enjoy. You can also SCUBA dive the Paquita wreck that lies in the heads. This is a drift dive for the advanced diver. The lagoon also offers great snorkeling! The Plettenberg Bay and Tsitsikamma area is filled with family activities. Here you will find great beaches, fishing spots and ocean adventures. Just outside Plettenberg Bay you will find “The Crags”. Here you will be able to visit Monkeyland, Birds of Eden ( biggest bird aviary in the southern hemisphere ), Jukani Game Reserve ( Lions, Tigers, Leopard, Black Leopard, Hyena and other great cats ) as well as the Elephant Sanctuary. 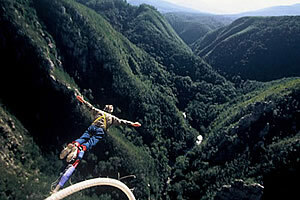 The world’s highest commercial Bungy Jump site is located just outside the area. This 216 meter jump off the Bloukranz Bridge is sure to give you an adrenalin rush like never before! At Tsitsikamma you can also do various activities like Black Water Tubing, and Canopy Tree Top Tours.